As an expat or a traveler do you worry about the food in foreign countries? About what to eat or not to eat? What is healthy, what is not? Well, research studies are out and the final result is below. Miss Footloose apologizes if you have already heard about this on the evening news, but it is important, so she feels it is worth passing along. WHAT TO EAT OR NOT TO EAT, IS THAT THE QUESTION? The French and Italians drink excessive amounts of red wine and also suffer fewer heart attacks than the British or Americans. The above is a fruit, as you may have guessed, classified as a citrus fruit. It’s called Buddha’s Hand, so you should be safe. These, dear readers, are barnacles, and apparently they are on the menu in the Azores, Portugal. You’re given a little fork with which to pry out the meat from the shells. For sale at Amazon. Click the picture. I’m sorry to do this to you but I could not resist offering this picture to you for your viewing pleasure. No, I have not tried these. The closest I’ve come to a scorpion was a big live one, coming right at me on a narrow path as I was walking toward the beach at night in West Africa. I saw him in the light of my flashlight and decided to turn back and get out of his way. I didn’t know I could have salted him, cooked him, and eaten him. One lives and one learns. What have been your challenges in the food and diet department while living in foreign countries? Did it bother you not to have familiar foods? Was it difficult to use the locally available foods in your cooking routines? Any funny stories? The Main de Buddha (Buddahs Hand) is certainly a citrus fruit. It is impossible to eat as such. It has no centre, no fruit inside, no juice, no pips – just white pith. But the zest is like no other and makes wonderfull lemon cillo. I haven’t seen it for sale often, but it is an impressive looking fruit. Would love to try the limoncello! In Mauritania, we watched them slaughter the goat, slide the intestines between two fingers to clean them, pop them into a pot of boiling water, sans salt, and then serve them to us an hour or so later. Ick. Intestines are chewy and rubbery and hard to digest! Which makes sense. Thanks everybody for you comments! I have replied to each one individually and you can see them all on my blog. Haggis was something that did not appeal to me, but I was a guest and ate it. As it was cooking, I figured it wasn’t something that would go on my favorites list so I just fried up LOTS of onion and garlic in olive oil. Enough to almost cover the taste. I love your conclusion since I know Italian and like red wine. I’ve eaten haggis a number of times in various places when celebrating Robert Burns Day. I even cooked it once, in Indonesia, because there were was only one Scotsman and the women in our expat group all helped out with the festivities. I assume our recipe was not totally authentic. It only basically contained groud beef and oats, and we cooked it in casserole dishes, not pig bladders, or whatever it is that they traditionally used. I’m reading a memoir, “Almost French” by Sarah Turnbull. She is Australian and married a French man. She interviewed Alain Ducasse a 3 star Michelin chef and said every dish had truffles. She had never tasted them and described them as tasting like tree bark. Truffles taste like tree bark? Was she in the habit of eating tree bark? I’m going to read that book; I have it on a list somewhere. Truffles taste to me like truffles, I’m not sure there’s anything else remotely like them. Though like most people I’ve never eaten tree bark, must be rather chewy. 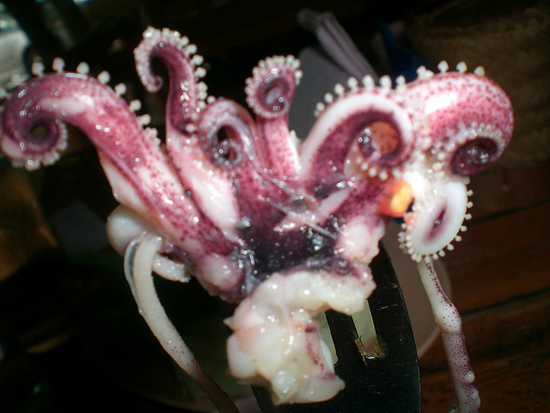 I love squid and octopus, but I’m not crazy about most meats, especially if they’re organ meat of any kind. The only really strange thing I’ve ever eaten was grasshoppers, and that was entirely by mistake. My husband can make us all lose our appetites regaling us with stories of fried blood in China and soup with offal, including something very soft and puffy, like lungs, served in an old tire in Sudan. Absolutelky right. I’d try most things but I think I’d give the roast scorpions a miss! Roast scorpions are in the “hope not to have to eat” category for me. I’m of the opinion to eat what the locals eat: they aren’t dropping dead by the wayside, so no reason for me to drop dead! That’s my take on it. However, once in a while you come across something that just is so unappealing (read disgusting) that it’s a problem. Of course we all have our own disgusting-levels. Thank you for that great story! In many places it is rude to refuse food, which can be a problem sometimes when you know it is not safe. Blood soup would not appeal to me either. When I spent some time in Finland, I learned to eat blood pancakes. You bought the (cow) blood in the supermarket, in cartons, just like milk . . . Very nutritious, supposedly. So now stop talking English! And eat your heart out. I ate duck gizzards in France and they were delicious. Probably the extend of my adventures though. I am strictly domestic in my eating habits. Oh, do try something new once in a while! It’s an adventure and you might discover something truly delicious! When my mother was a child in Holland, she got an orange for Christmas (from the church, I believe). They never got oranges because they were poor. Imagine she would not have tried it! Having seriously neglected my blog for over a year, I passed by to find your comment and new blog address! Great to be in touch again. Think that I might move too as there are better sites than Blogger these days. Glad you are back. My move to WordPress caused me to lose lots of subscribers. Wow, just this afternoon I was thinking about this very thing, what people are afraid to eat or will eat happily. I know people who’d experiment with meat yet are scared to eat strange fruits and vegetables. I feel safe with fruits and veggies. Rambutan tastes like lychee, almost; it’s sweeeet slurp. Buddha’s hand [the fruit shown here], looks like chicken foot, haha. But if it’s a fruit, I’ll try it. I always feel people miss something when they don’t try new foods. There are some wonderful foods out there in the world, and I figure that if other people eat them and don’t die, I probably won’t either. That said, it is hard sometimes to overcome some feelings and reactions to certain really weird stuff. Speaking English is what kills you… I’m still ‘digesting” that fact. You learn something new every day. If you have an open mind, you never know what might come wandering in. I’ve not come across grasshoppers, but I’d be willing to try! You never know what you might learn to like when you get into trying new and strange foods! That said, I understand the barnacles are more trouble than they’re worth. Awesome conclusion! You might have something there! Speaking of Octopus….I went to an Osteria last night and ate an amazing dish of cooked octopus – yummmm! Cheers! Love reading your posts! Thanks for the compliment, Reese. We’ve been to Italy a number of times and love everything octopus! I enjoyed your post, and agree eat, drink and learn another language! I love to cook, so when ever I get a craving for something from home I can usually whip up a meal that will keep the homesickness away. Fortunately, there is a store in Adelaide (our current home town) that sells all kinds of chile which is important to me since I am a Native New Mexican that grew up in chile. Once you’re hooked on chillies it is hard to do without. I learned about spicy food eating Indian curries in Kenya, and that was the beginning of the love affair. Australia’s cuisine is not of the hot variety, but I’m glad you can get your fix in Adelaide!